1. Every toilet I have seen has two flushing options: half or full. The half flush is for liquid only and uses less water than a normal flush. This feature has recently been added to certain bathrooms at Appalachian, but NZ is ahead of the game by having these toilets generally in all bathrooms. 2. It has become increasingly trendy to use reusable shopping bags in The States, but the popularity of these bags is overwhelming here in Auckland. Every type of store offers them and some even give them out for free after making a purchase. It is almost unlikely to see a person walk into a grocery store not holding a cloth bag. 3. All wall outlets are equipped with switches to turn on or off when the outlet is being used. 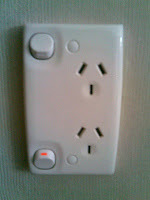 When you are not using a plug in the socket, just flip the switch to conserve even the slightest bit more electricity. 4. 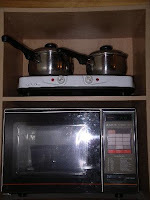 Speaking of switches, even the microwave and stovetop must be flipped on to use. It is strange for me to not rely on the microwave to also serve as a digital clock, but the concept of completely shutting down the appliances is sensible. 5. In some public restrooms, instead of offering paper towels or an electric hand dryer, they have cloth towels that come out of a dispenser. When you want to dry your hands, just pull down a clean piece and the used towel will roll back up into the box. At first, I wasn’t sure how to approach this device, but it does not use any electricity and creates no waste. A picture of this will be added soon.